1. Beat 1 egg plus 5 yolks until creamy and fluffy. Fold in flour and alternate it with milk. Add in melted butter and mix well. 2. Whip egg whites with a pinch of salt and sugar until soft peak. 3. Mix step (2) above with egg yolk batter till well combined. 4. Pour into fully lined baking pan (mine is 8" square). 5. Bake at preheated oven 170 deg C for 25 mins then reduce heat to 150 deg C for another 10 mins or till done. 6. Let the cake sits for 2 mins and unmould it. Note: This cake after cooling down will fall in height as there is no stabilising agent used at all. Hi LeeLee, I have read quite a few posts of yours @ Kitchen Capers and wanted very much to try out this Sponge Cake recipe. Unfortunately I have been unable to log in to KC for some time now. =< Thank goodness you added this recipe on your site! Yay! Will let you know how it goes, when I give it a try. Thanks for sharing! Anonymous said: Hugbear, I have tried out yr cotton sponge cake. Very nice. My family just love it. TQ for sharing. Hi Rene, hope to hear good news from you. Happy trying. This recipe was taken from Alex Goh's Creative Making of Cakes. But I changed the methods though as it is difficult to get the correct texture by following his methods in the cookbook. 1. Beat 5 egg yolks plus 1 egg until creamy. 2. Add in plain flour and milk and mix well. Then add in melted butter. 3. Whip up egg white till foamy. Add in sugar and salt gradually. Beat until soft peak. 4. Add the egg white mixture to the egg yolk mixture and mix well. Pour into a lined baking tin and bake at 170C for 25 mins and then at 150C for another 10 mins until skewer comes out clean. This recipe in the forums, you stated that sugar should be 120g and to beat the whites till soft peaks. So which is correct? The recipe in your blog? or the one in the forums? It is a matter of preference for amount of sugar. I further reduce the sugar to 90 gm bcos of my DH. I guess I should have indicated as 120 gm but with a note to adjust according to preference. Thanks for pointing it out to me. I stumbled upon your website when I was looking for new recipes. 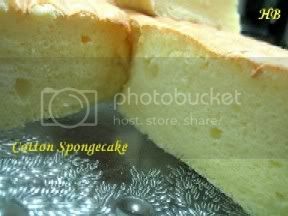 I just tried out your cotton spongecake recipe yesterday night. It was an instant hit with my family!! Mu hubby comments that it tastes like the nutritious cake (original) sold in Angie's Choice. Thanks for sharing this lovely recipe. But, can I clarify a few questions with you? 1.My cake bottom is a bit harder and darker, what could be the reason? 2.I find the cake actually shrinks after it cools down, can i use cream of tartar to whip with my egg whites instead of salt? I used to do this in chiffon cakes. 3. Can I substitute UHT milk with fresh milk? Sorry to ask so many questions. But I really like this cake and hope it will turn out better the next time round. i tried this recipe but i dont know why the cake sank after it cools down. and also i could not get the soft peaks when i beat the egg white. is it because i have to use the whisk the beat it beacuse i used the mixer. and also it wasnt really like "cooked" after the time you stated. should i extend the time? and waht does fluffy egg yolk mean? is it got lots of bubbles than its fluffy? This cake doesn't use any sponge stabilizer, so it is very normal for the cake to sink a little after it has cooled down. For the eggwhite, make sure that the bowl you use is oil free and no traces of eggyolk in it. You can whip to stiff peak if you like but do not overbeat the eggwhite or else it will be difficult to incorporate into the cake mixture. Creamy the eggyolks until it really creamy and the mixture slightly puff up. It will have a certain volume to it. HTH. Nice to meet you. I like your site and your recipe. Just wonder can i replace the UHT milk with dutch lady full cream milk? between do u have plum cake recipe? Anonymous, you can just whip up non-diary whipping cream to frost your cake. Slee, yes, you can replace the UHT milk with full cream milk or HL milk, or even skim milk. I was searching for chiffon cake recipe and came across cotton sponge cake. My first tryout is cooling on the rack at the moment and I couldnt resist cutting a slice to taste it. I added in 1/2 tsp of ovalette and orange zest. Hi.. I've tried this recipe and turn out it's very yummy!! But mine sank more den just a little.. Is there anything I can add to reduce the height sank? Hi Justen and Rayen's Mommy, the cake is not suppose to be wet. If you are using self-raising flour it should still be ok. Add the cream of tartar when you are beating the egg white. the pic looks so yummy and I tried it yesterday. I been following the recipe but turned out the cake is very wet except the outer layer, like Justen & Rayen's Mommy. I used fresh milk. Will this be the cause ? also how to make sure egg milk reach soft peak stage ? Hope you can enlighten me. Many thx. Hi, I've tried this too... Mine also turn out wet and look like not cooked. However, there's no batter stick to the chopstick... How come? Hi Shi Qi, try not to overmix the batter. The cake after cooling down will drop quite a bit in height. can i make these into mini cupcakes instead of baking it as a whole cake? I'm new to baking. May i ask..when you mention mix, does it mean mix with a spoon in a circular motion? or using the mixer machine? Also how shld the texture of the cake be? I tried last nite. The cake looked nice but the texture is more of semi-compact n alittle moist. Is this correct? or should it be fluffy dry like a normal spongecake? hihi, i tried ur receipe and it tastes great! however like most others, my cake sink in the middle. I also sank the moment i poke it in the middle to test if it is cooked or not haha.. maybe not cooked long enuf? or perhaps i used fresh milk? hi this is Gab again..
Can I add pandan flavoring / essence in this recipe? how much will I add? I Think I can't make a spongecake, coz' I don't know where can I buy a spongecake stabilizer here in the Philippines..
Gab, for pandan flavour, just add pandan paste about 1 to 2 tsp is enough. If coffee flavour, either use 1 tbsp coffee elmuco or dissovle 1 tbsp of instant coffee powder in the milk before you add the milk into the batter. Hi baking mum, i would like to try this recipe cause i love sponge cake but i wanna ask a few questions before i try to make it... first of all what is UHT milk? any substitute? and can i request conversion of measurements from gm or ml to cups instead? im not expert in baking thats why i prefer to use cups than gm or ml... thanks so much! Hi Ellen, UHT milk means Ultra-high temperature processed milk or Ultra heat treatment milk. You can just replace with any fresh milk, HL milk, skimmed milk. I have given a converter in my blog so you can try to get the conversion from there. I tried to convert 120g of sugar and it says 0.6 US cup of sugar. Wonder if it helps. Usually 1 cup of flour is about 125g. LeeLee, can you give me the recipe for your butter cream too? Hi Mandy, the buttercream recipe is under Sugar Roll. May I know if you used cake flour or plain flour for this recipe. Do you think I can use this for a birthday cake that is to be decorated with cream? I used caked flour for this recipe. You can use this as a base for your birthday cake. I just read your last post about using cake flour.I used all purpose flour.So I should have used less say 70g of all purpose flour.Baked this today but mine came out with a nice layer of sponge but base is like a custard.It seems to sink a lot ,finally about 3/4 inch height,half sponge and half custard. I presume it should be all sponge so something went wrong.Any advice? By the way,you have a great blog,would be even better if you leave some tip for the more sensitive recipes to avoid the usual problems. Hi Lim, cake flour makes the cake more fine in texture. If you are using plain flour, it will still be the same amount of flour to be used. Your problem is either the eggwhite is not beaten well enough or when mixing in the flour, you mixed too much causing the beaten eggwhite to fall. Overmixing usually results in a dense layer at the bottom of your cake. Try not to mix too long and too hard. BTW, noted your comment about giving tips on more sensitive recipes. I will try to do that in future whenever I can. My second attempt at this recipe. Turned out well this time as there is no dense layer at the bottom.However the texture(although soft) does not taste as light as I believe most sponge cake texture should be. Is it because the egg+egg yolk is not beaten enough.How do I check if it is beaten enough.The egg white I know is ok as bowl can be turned without it falling out. Appreciate any tips to get it right? Do you mean by the lines created by leaving the cake on the wire cooling rack to cool down. No secret lah, the lines are there because of the cooling rack when the cake is turned out from the pan onto the rack to cool down. try yr cotton sponge cake but not successful some how the bottom too damp??? dont know why? Hi hugbear, I tried this recipe of yours but weirdly it turned out to be more like pudding or kueh compared to a soft cake. ): any idea what have I done wrongly.? I was just wondering if u used castor/superfine sugar or just regular granulated white sugar in this recipe? =] I'm plannin on makin this recipe soon, thank you! !